Sorry for no indie review yesterday, I was trying to get this one done, but didn't have a chance to finish trying all of the perfumes. 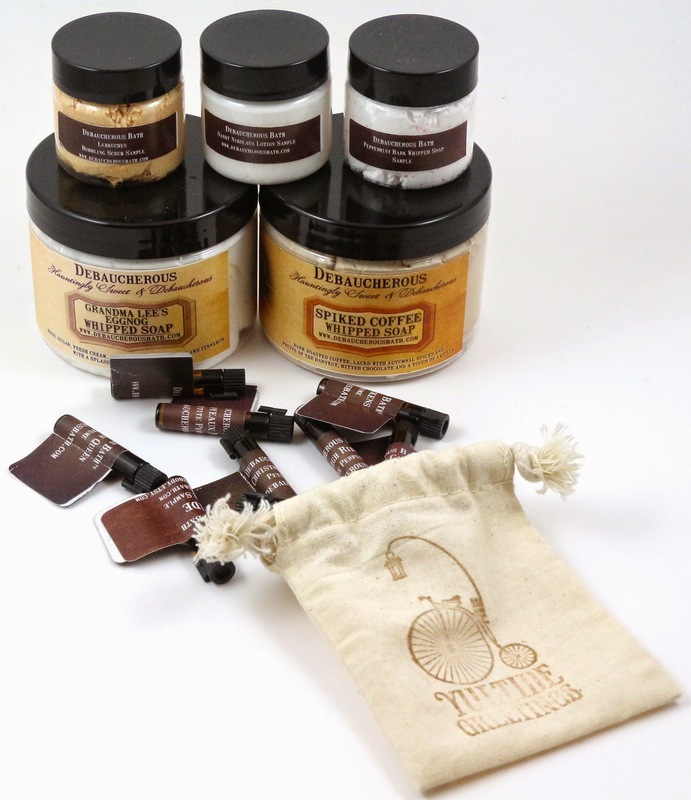 Debaucherous Bath is another indie bath and body product company that I haven't heard a lot about, but I have heard great things about the products themselves. I figured I should try some of the Christmas Collection scents to review and see for myself how they were as well as the company itself. Debaucherous Bath is located in Southern California. 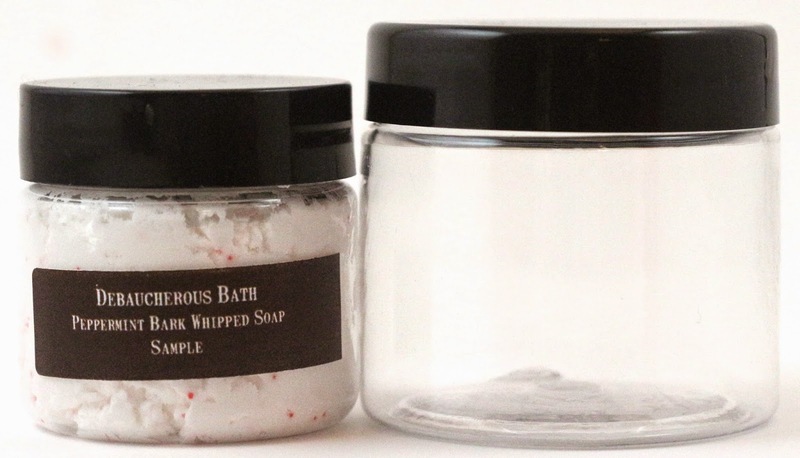 I would like to mention that their original name was Haus of Haunt, which is a combination of two very popular indie bath and body companies, both of which I have reviewed before; Haus of Gloi, and Haunt Beguiling, which is just one reason I was hesitant to order before now. A little disclosure for this review, I am in an indie Secret Santa, and a few of us ordered from Debaucherous Bath and a few in our group had some issues too, which I would like to highlight as well, since they are bigger problems than I had, but just as telling about the company. I ordered within the first couple of days the Christmas collection went on the store, and it took 19 business days for it to ship. Yes, it was within the possible turnaround time, but why would you have your turnaround time be 10-14 business days, and then stipulate that it could take up to 21 business days!? That is a crazy amount of time, basically 4 weeks. After it finally shipped, it was shipped via USPS 2-Day Priority, and arrived in 3 days, because of the Thanksgiving holiday in the middle there. Some of the ladies in our Secret Santa still have not received their orders, and ordered around the same time I did. Many of us have tried contacting the owner, and she did not respond, but printed a shipping label, that never checked in to the post office. After over a week, it's not a USPS tracking issue, she never took it to the post office. Product Size - Not all scents are offered every way, but sample sizes are stated to be 1.5 oz of product by weight in a 2 oz jar. This is false, they are 1 oz jars, not 2 oz jars. 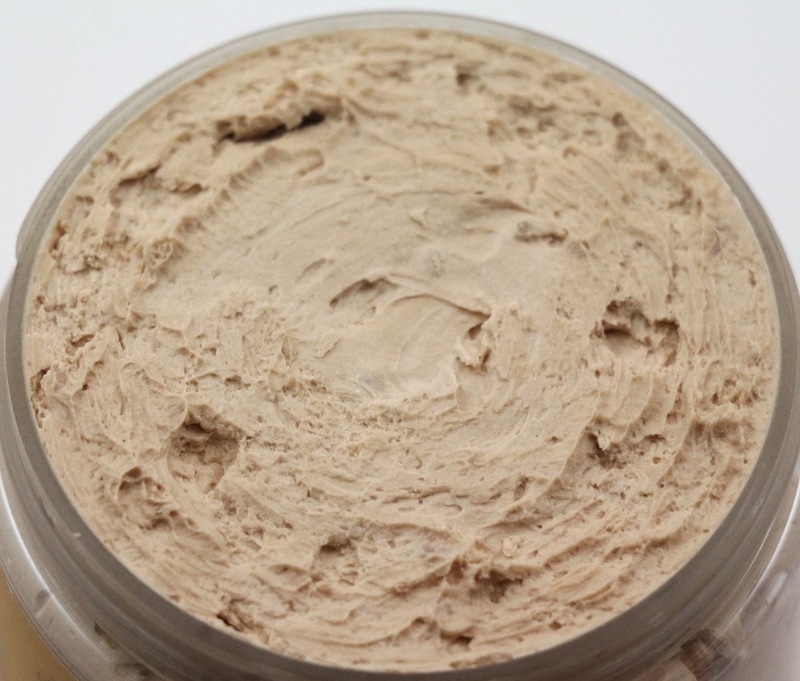 Full size products are in 4 oz jars, but are stated in the Etsy listings as 5.5 oz total net weight for both lotion and whipped soap. But you wouldn't be able to tell from the labels on the jars themselves because they don't list the size or amount on the samples. Sample jars do not list the ingredients either. Update 12/6: Here's a photo comparison. Finally had a chance to take a photo comparing the 1 oz Debaucherous jar on the left, and a 2 oz jar I have purchased myself on the right. Free Samples - I received a free perfume sample of Halloween Pin Up, which was the extra bonus sample of the month for October. You are also allowed to choose a scent for a free perfume sample, so I received that as well. Lebkuchen Bubbling Scrub - "Honey, hazelnuts and walnuts, candied orange and lemon peel, marzipan, spices of cardamom, cinnamon and ginger." This smells like gingerbread to me. It reminds me of Haus of Gloi's Gingerbread Butter Bomb, but not as good. The scent for this is good, but it's not making me want to eat it. The sugar doesn't feel like that large of a crystal to me, it's almost like half melted white sugar, so while it is a scrub, it's not very exfoliating. Here's a close up of the bubbling scrub texture. It doesn't seem to have a lot of sugar in it, it's not dense really. More like the whipped soap with just a bit of sugar added. Sankt Nikolaus Lotion - "Snowflakes landing on Douglas fir trees, vetiver, spearmint with a hint of hot cocoa and freshly baked butter cookies." To me, this smells like a less minty and more sugary version of Haus of Gloi's Wintervale scent. Almost exactly. Even most of the notes are the same. It's good, don't get me wrong, but the fact that I know it's trying to copy Wintervale a little really rubs me the wrong way. I think if you don't like the minty-ness aspect to Wintervale, this is much less that and more of a baked good and fir scent, you'll probably like this more. Once you've got it on, it smells like a touch of spearmint with the sweet baked scent of the cookies. I don't get much of the fir or vetiver. 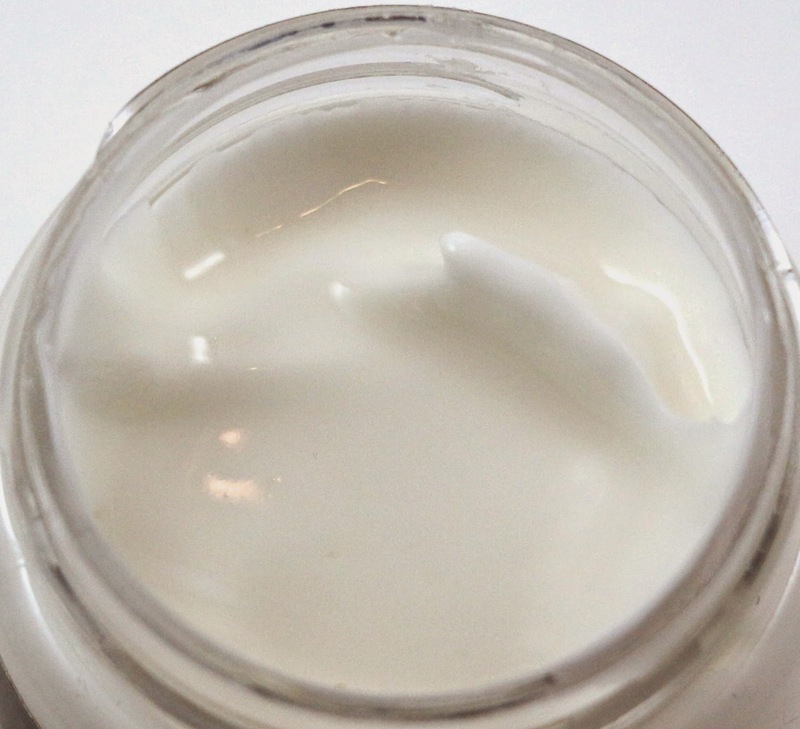 Here's a close up of the lotion texture, it's very thin. I think you'd really need multiple uses of this to moisturize winter's dryness on your hands and body. New Victorian Christmas Perfume Sampler, I was sent a bag with 9 of the 10 perfumes that were supposed to be in the bag. Update 12/6: According to DB, this listing was for 7 of the 10 perfumes, chosen randomly, which the listing does not state. She said she threw in 2 extras, which is why I only received 9 of them. It's quite confusing because the listing lists out all 10 scents, says you will receive all 7 of them, but no where does it say these are 7 of the 10, chosen randomly. Blue Sparrow - "Wild Chrysanthemums, sweet snow, autumn leaves, one last rose, a tinge of cinnamon bark, sweet birch and woodsmoke." This smells really gross. It's like rose with something else nasty. I don't like this at all. I wouldn't ever wear this, it actually makes me cringe. It smells like rose and a bad smoke scent. Maybe I'm also smelling the Chrysanthemums. And the rose note doesn't smell good either. I do not recommend this scent at all. Charles Dickens - "Ambergris, Wool Coat, Leather Boots, Pine Needles, Old Cedar and Cranberry Chutney." Smells like a grandfather's cologne, but the leather smells really plasticky and artificial. This is not a high quality scent. Christmas Carol - "Bright Red Berries, Rum Laced Cocoa, Butter Rich Shortbread Cookies, Almond Marzipan, Orange Zest and a hint of Nutmeg Butter." I actually really like this one, you can mostly smell the orange and everything else just comes together to smell like a wintery Christmas food scent. There's a lot going on in this perfume, but it smells yummy. Christmas Stockings - "Ribbon Candy, Sweet Fudge, a Crackling Fire, Antique Lace, Soft Satin and Colorful Ribbons." It definitely smells like ribbon candy, but this is sickly sweet. Like an overly fake blackberry scent that just smells too strong. I wouldn't wear this, or even give it to anyone I remotely like. Joyeaux Noel - "Victorian Christmas Tree decorated with freshly popped popcorn garland, sweet winter berries, silver tinsel and holly." This smells ok, you get the popcorn and the berries, but it smells similar to the other berry perfumes in this collection. And it smells like something that would be sold at a major store, it's good, but not really that exciting or great quality. Kiss Under The Mistletoe - "Moroccan Citron, Black Currant, Sweet Fig, Northern Bayberry, Winter White Florals, Watermint, Winter Spruce and Sweet Vanilla." 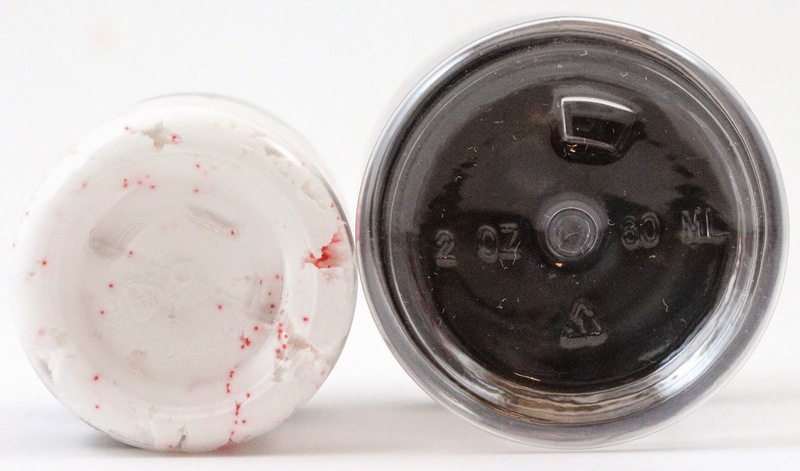 Immediately I get the black currant, and then right after it disappears. This smells like something Bath and Body Works would carry during the holidays. I get the berries, the citrus, the florals, and the vanilla. It's good, but this just seems to immediately disappear on the skin. It doesn't have much staying power. Silver Bells - "A Pristine Forest of Blue Spruce and Prussian Cypress, Sparkling Snow, Argentinian Lemon Verbena, Precious Woods, Delicate White Florals & a Frigid Ozone." I never received this scent. I emailed about it being missing from my order, and never heard back. I don't expect to ever get this. Sleigh Ride - "Buttered Caramel, ribbons of Snow Cream, Bright Red Winter Berries and Lemon Zest." This smells pretty good, the caramel is there right away, but it's muted with the tinge of lemon. After a minute or so though it just smells like straight cream. And it's not long lasting either. Good, but it's not going to stick around. The Victorian Queen - "Bulgarian Lavender, Amber Resin, Antique Lace and Aged Vanilla." This isn't bad, but it's kind of like a lavender perfume for an older woman. The amber gives it that vibe for me, so it smells good, but it's probably not something I would wear myself. Yuletide - "Sweet Fig, Fresh Pinecones, Apple Cider, Burning Logs, Snowflakes and cinnamon Bark." This just smells like figs, and really really sweet ones. I don't like this one, it would most definitely give me a headache. Peppermint Bark Whipped Soap - "Dark Chocolate, White Chocolate, and crisp bites of minty candy canes." This is actually a really good peppermint scent, I used to hate peppermint but for some reason I've gotten into it more recently. With chocolate in there it's a really great scent, and the bits of candy are cute and make it smell good, but they could be too abrasive. It smells like the really good mint chocolate ice cream I have been liking recently. Grandma Lee's Eggnog Whipped Soap - "Eggs, sugar, fresh cream, a touch of clove, nutmeg and cinnamon with a splash of Grandma's special rum." In the jar this smells like a really good eggnog scent, not too weird like some other eggnog scents have a tendency to do. You can smell the dash of rum, but once you start using this, the scent disappears almost immediately. Once you've put it on your skin it just smells like regular soap. I like the little bit of nutmeg it's got in it, you can definitely smell that. This smells good. In use, it doesn't smell much. The whipped soap is a good product and this scent is a good product. Spiked Coffee Whipped Soap - "Dark roasted coffee, laced with autumnal spices and fruits of the harvest, bitter chocolate and a touch of vanilla." I love the scent of this, it can be hard to get a good coffee scent, but this smells wonderful. Almost like a mocha kind of, coffee with chocolate and spices. Definitely cinnamon in there. It's good. I can't really stress that enough, the scents of the products are good. Nothing spectacular. Nothing amazing. Just good. 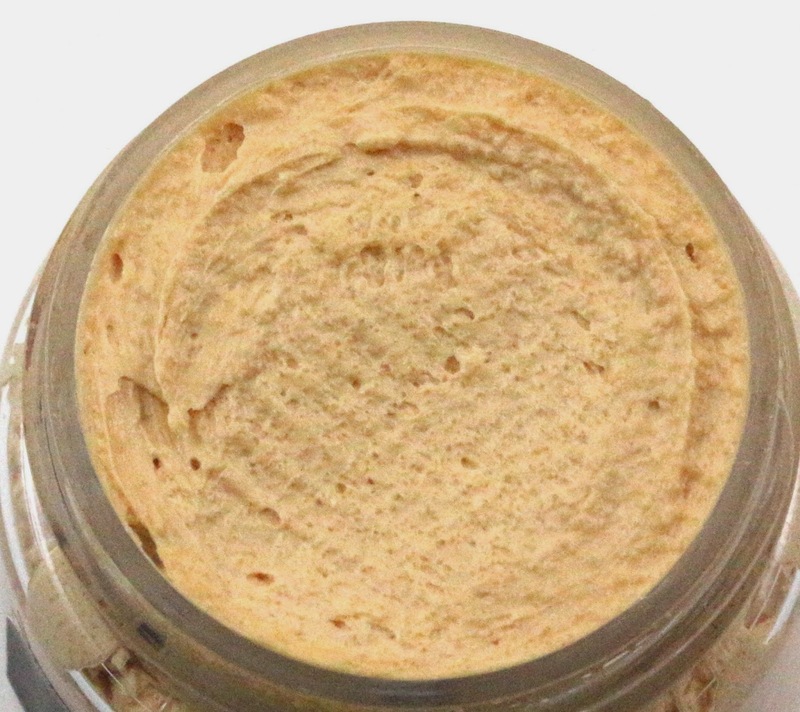 Here is a close up of the whipped soap texture. It lathers very well with a loofah, but the scent doesn't last long. It's usually gone by the time the soap reaches your skin. It's kind of in the middle of a whipped soap and a cream soap. Thick and dense, but slightly airy. 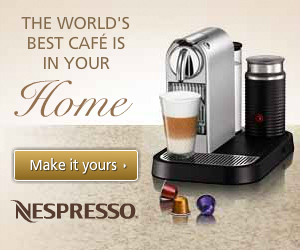 Overall, I think the products are good, surprisingly good for a company I haven't heard much about. A bit overpriced in my opinion, perfume samples were the equivalent of $3.50 each, with no real discount for the sample pack. 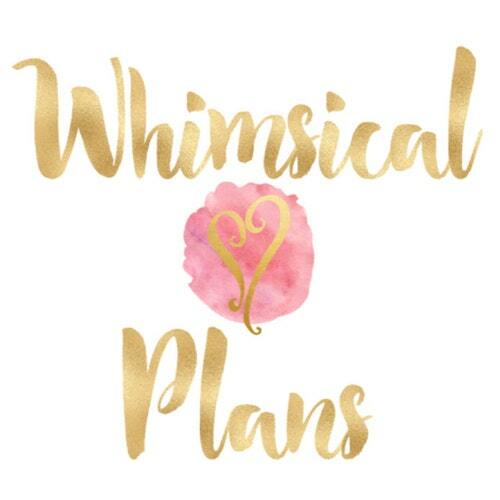 Whipped soaps were $10 for a 4 oz jar, and minis were $3.75 for 1 oz, which other companies sell 2 oz for $5 or less. But, adding in all the problems I and others had, I don't think it's worth it. The packaging on the samples is not as nice as the full size jars, and they are only 1 oz, despite the Etsy listings stating they are 2 oz jars. Would I recommend you buy anything from this company? Absolutely not. Read on to find out why. Customer Service (get a snack, this is going to be a while...) - I want to mention a little disclosure here that I am in a group doing an indie Secret Santa and we contacted the owner to see if she'd be willing to give us a discount since many of us had her products on our wish lists, and we've all been more likely to buy from some of the companies who gave us discounts. I'll detail this further down in the review. D - Ordered October 28th, emailed for the first time November 26th because her tracking hadn't moved for a week. She emailed again on November 28th with still no response, and has opened an Etsy Case about not receiving her order and not hearing anything from the owner. She still does not have her order, but her tracking has finally registered at USPS after 13 days. C - Ordered October 25th and a shipping label was created November 20th. 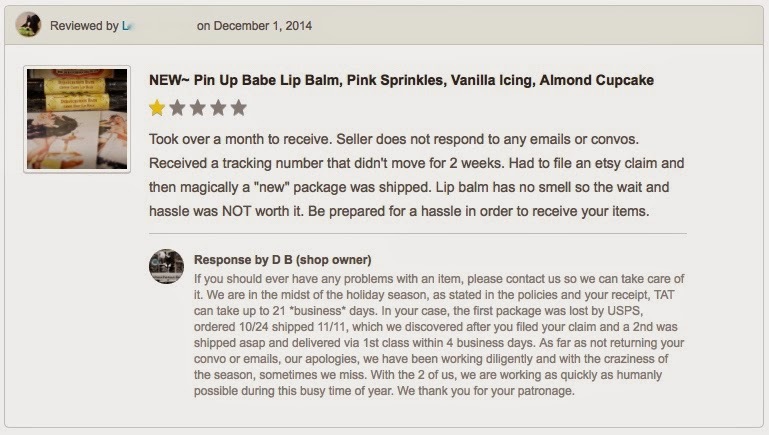 She sent an Etsy convo November 29th and December 2nd, and no response from the owner. She is going to be filing a Paypal dispute, and still does not have her order. A.H. - Ordered October 25th and a shipping label was created November 11th, after she emailed the owner that was never replied to. Items arrived November 15th, no free samples included. It is interesting to note that the owner had time to reply to a negative review, but did not seem to have time to email back any of us. And how they seemed to have "missed" emails and Etsy claims filed for several of us is absurd. Me - Ordered October 29th, I emailed for the first time on November 21st, received tracking on November 25th and my order arrived November 28th. 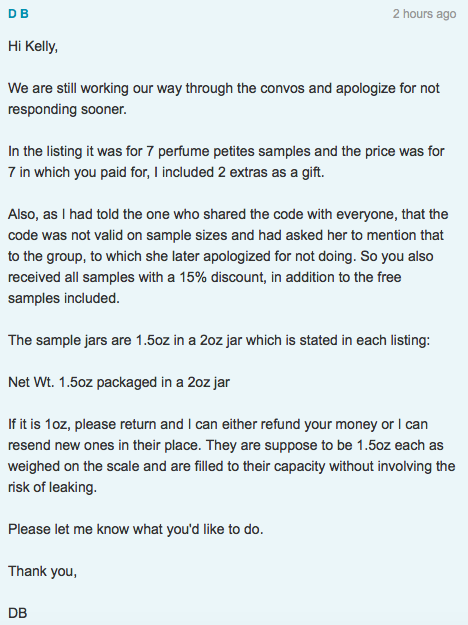 Never did get a reply, and my order was missing one perfume sample that I paid for. After all this, anyone in our group who had not ordered from there yet, pretty much thought twice about doing so. Most of us, as well as many other customers, probably would not blindly order full size products. We wanted to try samples to see how we liked the products, scents, and the company which none of us had ever ordered from. And the fact that she gave us the code, it could have been keyed in from the beginning to not work on samples if that's what she wanted, but it wasn't. 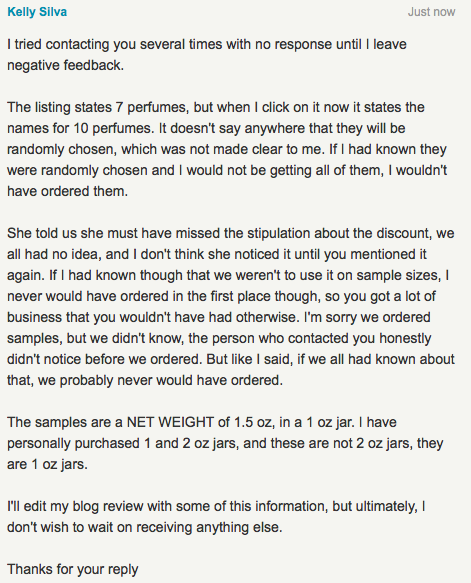 If I had known she wouldn't allow the discount to be used on samples, I probably never would have ordered. I would like to mention that one person, A.M., had no issues, received her tracking quickly after she ordered, received all her items, and had no reason to contact the owner. Obviously, you can see most of us did not receive our items we ordered for a month, despite the shop saying all orders had been shipped out. None of us received any communication back from the owner after attempts to contact or file disputes. And I would like to highlight the part about the owner asking that we leave positive feedback in her store, and contact her before we submit bad feedback. I've contacted her about my missing perfume, with no response. 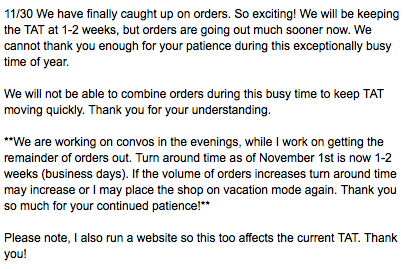 Availability - All of the products I ordered are still available for purchase. Overall Satisfaction - Even though I liked most of the products, with the exception of the perfumes, after everything with customer service, I will not be ordering from Debaucherous Bath again. Too many problems to be worth it. I refuse to have to nag the owner of a company to receive my products. And the sudden halt on all communication with me, and others, is not something I wish to deal with. 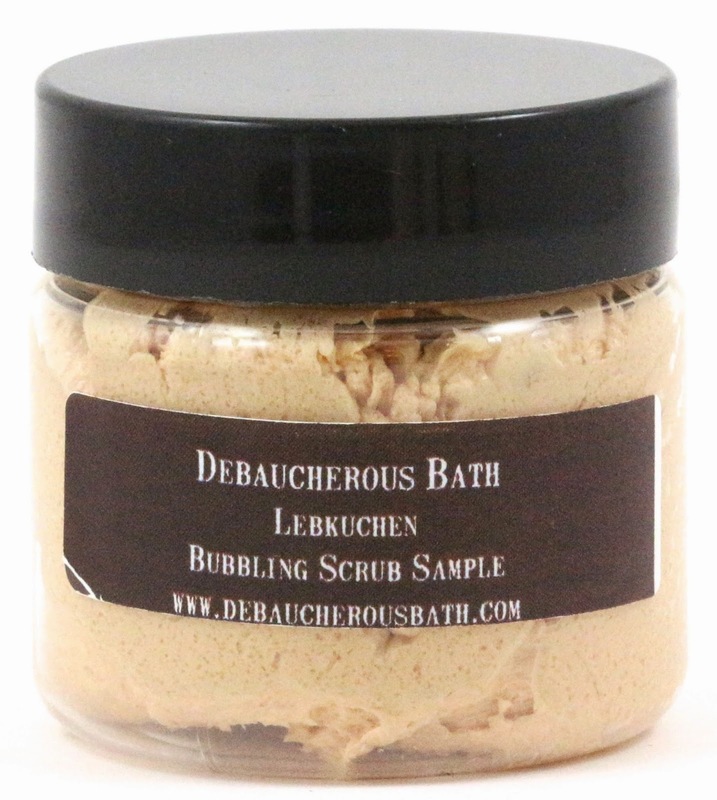 What did you think of Debaucherous Bath? Let me know in the comments! Disclosure: I received a discount on these items. This is my completely honest review. Thank you for writing this review. 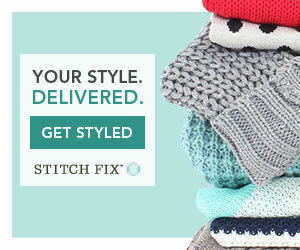 I am new to Etsy, and I was looking forward to trying DB products. I ordered on November 5th, and tracking says my order shipped on December 3rd. I am still waiting. I placed orders with other sellers later, and I already have my products. So disappointed! If your tracking has not updated to check in to USPS yet, or gone past "Shipping Label Created" you have a few options available to you. You can file an Etsy claim which takes 14 days I believe, you can file a Paypal claim if you would like your money back, or check out the FTC rules on online orders. I can bet you though that filing an Etsy claim will get you your stuff. Just a thought... she says "21 BUSINESS DAYS" isn't that over the 30 days total that a business has to ship an item without consent? So she says 21 days, then if you try to complain, she changes it to 21 business days? Seems like classic scam tactic, IMO. Also, I received 3 items, and they are very clearly 1oz jars, not 2oz. It is indeed over the 30 days the FTC stipulates an order must be sent by, or be given consent by the buyer for any delays that occur. Thank you for sharing this post. I also had a negative experience with Debaucherous Bath, and it frustrates me to see other people are experiencing similar issues to what I went through. You definitely aren't alone, but hopefully this post will help people for the future. I ordered from her on October 14th and didn't receive my order until Dec. 3rd. I contacted her FIVE TIMES, with no response. Not only that, but the labels on my full sized scrub and whipped soap were crooked and looked sloppy. Hopefully more people will read your blog and save themselves from a headache. Oh wow, five times? That's insane. I hope this post helps other people as well. I was so excited to try their scents, but I too had problems. I ordered on October 28th and it took over a month to receive. I sent a message and never received a response. Bad business practices. I think a smart thing to do would be to stop orders for awhile if you were that behind or only offer products that have already been made and ready to ship. I definitely would have ordered again because I love the scents I finally received, but it's not worth it! Oh bummer, I just placed an order last night for a couple sample size lotions. I just happened to be looking through your blog today and saw this review. I can't believe someone would be so stupid to make so many mistakes. As a past beauty blogger, this ticks me off. So sorry you had to purchase from her and a have a bad experience. Good companies seem hard to come by! I did the same thing as KimmieKarma above. Placed an order and then found your post. I was hopeful I would be lucky, but no. Today is the 21st business day since I placed my order and it hasn't shipped. I have opened a case with Etsy and with Paypal, but we shall see if DB responds. I have learned my lesson! I am wondering how she has so much good feedback. It took almost 8 weeks for me to receive my first order from this company! I emailed numerous times with no response and the only time I got a response was when I opened an ETSY case. Those products finally arrived and I loved them! I chose the Marshmallow Woods collection. Then against my better judgement, I ordered again. This time I was prepared to wait forever for my products to ship. I received a shipping notice about 3 weeks after the order was placed but waited nearly two more weeks for my shipping to update (this was after she posted a notice saying that all orders had shipped). As much as I love this bath line, I WILL NOT be ordering from this store again. Customer service is non-existent and the seller will only speak to you when you file a complaint or leave negative feedback. What a shame!